A vicious beast? A gentle giant? Or is it an animal at all? 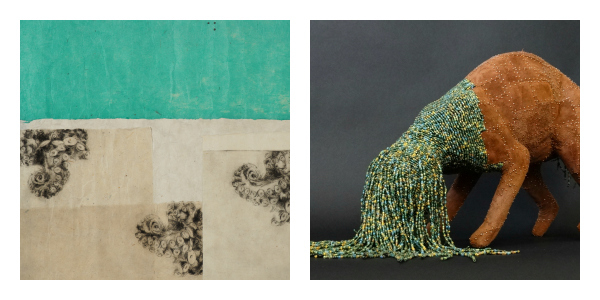 Decide for yourself when you see “Delicate Beasts” an exhibition of new work by Christy Puetz & Ingrid Restemayer. Christy Puetz and Ingrid Restemayer studied Fiberarts together at the University of North Dakota in the 1990’s. They have a history of over 20 years collaborating & exhibiting together. Dedicated to the use of methods and materials traditionally associated with craft, they explore the boundaries and reconceive how craft materials are seen in the fine art world. Christy Puetz’s recent sculptures are beautifully grotesque little creatures. Holding poses that seem frozen in time, each piece is covered with combinations of glass beads, felted wool, dried paint slabs, silk cocoons and other found elements. The materials and exaggerated body parts cause the animals to appear in a state of transformation, or shedding. Because of the “true to life” scale and the colorful, delicately beaded surfaces viewers are drawn in for a closer look. Ingrid Restemayer’s latest works include gentle etchings of beastly animals like buffalo, elephants and octopi collaged and hand-embroidered. The etchings themselves are intimate studies of individual animals’ expressions and organic movements captured in a still, illustrated moment of individual personality. The images are small. Their size dictated by the etched substrate – discarded retail gift cards. Pairing the tiny portraits with spans of running stitches or French knots also brings each one of these studies to a place of gentle meditation. In this is the age of instant electronic communication, the age of getting anything instantly via internet downloads to your phone, sustainable tactics in art creation, things made by the human hand often have the power to promote further human interaction. This work is a reminder to society that non-mechanized art and imagery is still achievable and still experiential.